These 5" (13 cm) long spring scissors are ideal for adults with special needs or children who are developing motor skills along with hand-eye coordination. 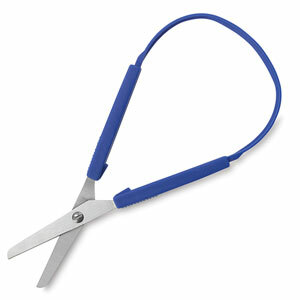 The scissors are operated by squeezing gently using the thumb and fingers or the fingers and palm of the hand, and are suitable for right-handed or left-handed users. Stainless steel blades are attached to a plastic handle.